Helmet-mounted displays are priceless on the battlefield. And expensive: The proto-Google Glass headset, for instance, is absolutely useful for the average soldier, but way too pricey to be practical. That’s why folks at DARPA are freaking out about the heads up display that researchers hacked together for a few hundred quid. Let’s get one thing straight: This is hardly the new F-35 helmet—that insanely overpriced fighter jet’s Gen III Helmet Mounted-Display System (HMDS) that shows the pilot all of the essential information needed to slam through the sound barrier and launch missiles at enemy aircraft. 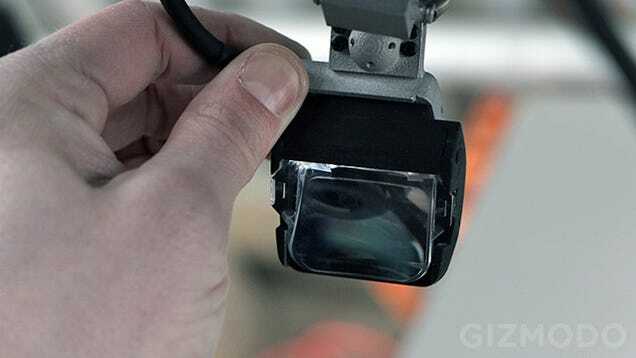 It’s also so advanced, it effectively turns the entire plane into glass by using a series of infrared cameras mounted on the hull to enable the pilot to “look through” the airframe. The whole set up also costs about $400,000/£268,000. That’s what makes DARPA’s garage-built version so interesting. A team of young engineers built the whole setup at a cost that’s likely less than the price of the chin strap cost on the F-35 HMDS. I tried a hacked-together prototype of the device at a recent DARPA demo day in rural Virginia. It doesn’t exactly look like a Star Wars prop, but that’s part of the point. It’s built to be useful, and it is. Based on what I learned about the simple feature set, it actually sounds like it could save soldiers lives. The new helmet-mounted display system is designed for infantry soldiers, not fighter pilots. However, the objective to optimise attention remains the same. If you’re leading a patrol into enemy territory, there are a million things to worry about. You’re the one tasked with finding the safest, most efficient path to your destination. You’re the soldier who needs to identify any insurgents who may happen to cross your path. You’re the first line of defence if you walk into a fire fight. The DARPA device focuses on these key use cases. All three of the programmed features I saw at the demo day focus on navigation and threat detection. The entire system is built within DARPA’s TransApp ecosystem, the same ambitious software initiative that powers thousands of soldiers’ smartphones on the battlefield. One view through the helmet-mounted display is a simple satellite view of the terrain, the mission plan, and the soldier’s position. Another related view, shown in simplified form below, provides data more directly related to the soldiers. Note the marker for a known IED. These features are all based on the Maps app developed by TransApp as a way not only for soldiers to replace the World War II era methods of charting out points on paper with protractors. It’s honestly not much different than the navigation features on Google Glass. 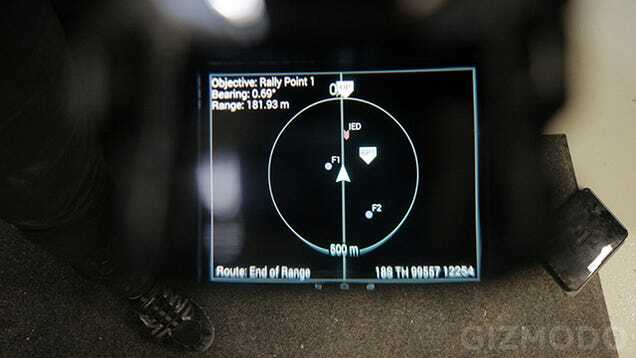 The display also detects the soldier’s head movements so that it always shows the relevant orientation. The third view is perhaps the most interesting, as it plugs into the military’s larger database of known insurgents and civilians. (One other application of this information is an app called WhoDat which is kind of like a collection of Topp Trumps cards made up of locals, their affiliations, and their level of hostility.) This view will enable the soldier to flip through profile pictures of known locals, helping to identify who’s a threat and who’s not. While it’s easy to draw comparisons between this cheap and easy helmet-mounted display and the not-so-cheap and not-so-easy Google Glass technology, the design is much more utilitarian. The display can flip up and down so that the soldier wearing it can enjoy an unobstructed view whenever he or she wants. As such, the display itself is opaque and lacks the augmented-reality effect of some heads up displays. All that said! This very high tech and ultra useful device costs about the same as a good smartphone—not the price of a fancy house. That means that more soldiers could take advantage use of the potentially lifesaving technology which, let’s be honest, is inevitably more important than making killing easier.